in at the last minute when the Head of Careers unexpectantly landed himself in A&E! The summer programme this year has included interactive sessions on music technology, Everest expeditions, medical ethics, business & finance, commercial awareness and engineering problem solving, the Humberside HE Exhibition at Hull University, as well as research into suitable courses via the Centigrade online analysis. University placements. Subjects ranged from Anthropology to Zoology with students submitting their personal CVs for scrutiny by experts in their fields. I was challenged in different ways by the two different interviews. It was good to have contrasting interview techniques. The formality of the event made it realistic – it will help my nerves for the real thing. and above to meet leaders in the Engineering and Manufacturing Sectors. Local and international employers set up a range of hands-on displays for the students to try out their skills and aptitudes. Professional advice and guidance was on offer at all times to encourage the students to explore this as a future career area. Really, really, really helpful! Thank you! 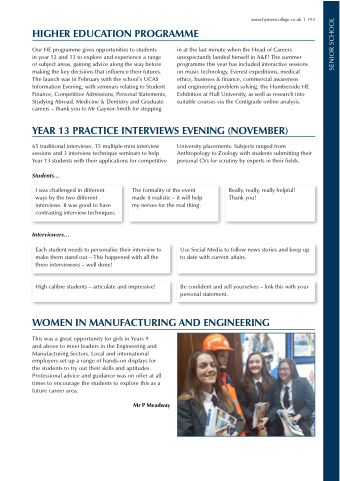 Each student needs to personalise their interview to make them stand out – This happened with all the three interviewees – well done! Use Social Media to follow news stories and keep up to date with current affairs. High calibre students – articulate and impressive! Be confident and sell yourselves – link this with your personal statement.